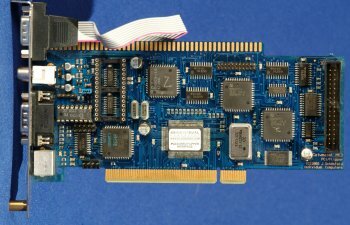 The Catweasel Mk-III is quite a unique card, but is very innovative in that it supports multiple ways to connect it to your machine. It can be used in a PCI slot, flipped upside down and used in a Zorro slot, or it can be attached to the clockport on the A1200. The main purpose of the Catweasel is to allow access to non-standard disks using ordinary PC-diskdrives, even when all other solutions require the original computer. The Catweasel is capable of reading almost any disk format in 5.25" and 3.5" drives. For example, you can read a C64 170K 5.25" disk, even in a 1.2MB PC 5.25" disk drive. Individual computers are currently working on supporting over 1100 disk formats. Unlike the earlier versions of the Catweasel, this version also includes two SUB D-9 digital joystick ports, the exact same ports as used for mice and joysticks on the Amiga, Atari and countless other computers and consoles. Also included on the card is a mini-DIN connector designed for connecting A4000 keyboards, however with a PS/2 adapter you can also connect A2000 and A3000 keyboards. Last but not least, the card has a (optional) SID chip on it. The SID chip was responsible for producing the sound in the Commodore 64!. With the Catweasel you can play SID tunes with the same accuracy and quality you would hear on a real Commodore 64. The Catweasel is also capable of activating the fourth voice on both the 6581 and 8580 versions of the SID chip. The Catweasel Mk-III is designed to be used with multiple systems including Amiga (Zorro), Amiga 1200, Amiga with PCI, Windows, Mac, AmigaOne and Pegasos. It is not clear however if all features are available under every operating system. In particular there have been reports of flaky keyboard support and broken disk drive emulation on the Pegasos running MorphOS.